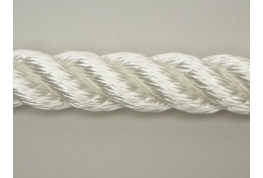 3 strand nylon rope -diameters from 6mm to 24mm - colour: white The classic choice for mooring and anchoring, because it is ideal for absorbing shock loads. It also has good abrasion and UV resistance. Remember when selecting the size that Nylon has some strength reduction when wet.